Jawaharlal Nehru (November 14, 1989 - May 27, 1964), popularly known as Pandit Nehru and Chacha Nehru was the first Prime Minister of Independent India and a central figure in Indian politics in the 20th Century. Pandit Nehru, not only known for his charasmatic persona but also for his enthralling words which can spell bound thousands of thousands when they start listening to him. So if you are searching for some of his best quotes and inspiring words, now you don't need to search for them anymore. 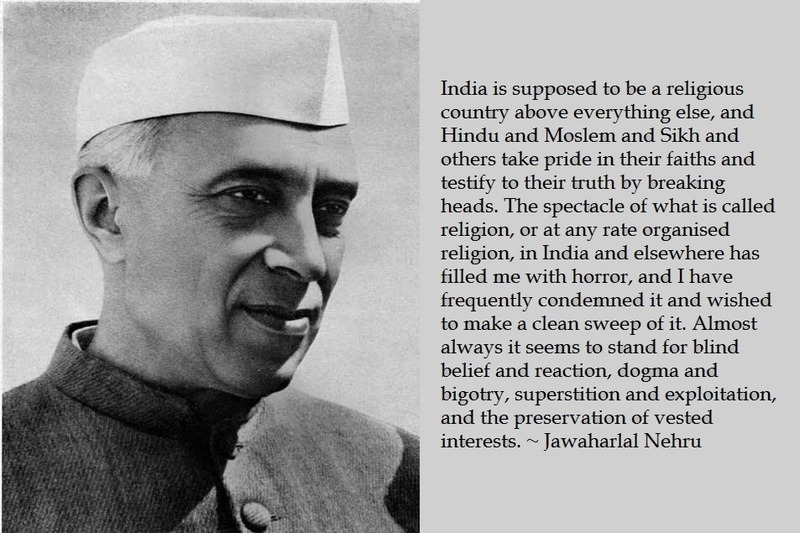 As here I have compiled down some of the famous Jawaharlal Nehru quotes. Just hope you will like the quote compilation and share some of Chacha Nehru i.e. Pandit Jawaharlal Nehru quotes with your friends and family. What the mysterious is I do not know. I do not call it God because God has come to mean much that I do not believe in. I find myself incapable of thinking of a deity or of any unknown supreme power in anthropomorphic terms, and the fact that many people think so is continually a source of surprise to me. Any idea of a personal God seems very odd to me. Without that passion and urge, there is a gradual oozing out of hope and vitality, a settling down on lower levels of existence, a slow merging into non-existence. We become prisoners of the past and some part of its immobility sticks to us. We have all become wayfarers and travellers marching on and on ....Yet,for those who can adapt themselves to this continuous journeying,there is no regret and they would not have it otherwise.A reture to the dull uneventful past is unthinkable. The best and noblest gifts of humanity cannot be the monopoly of a particular race or country; its scope may not be limited nor may it be regarded as the miser's hoard buried underground. Evil unchecked grows, evil tolerated poisons the whole system.